Using a steam cleaner for cleaning interiors of a car is the safest way to deal with bad odors and stubborn stains from fabrics. This device is an all-round detailing tool which can be used for cleaning auto detailing from leather to fabrics. Along with this, it can be used for cleaning center consoles and many more. We'll let you know the technology behind this. Steam cleaner uses hot water and converts it into steam for cleaning purpose. And, it is believed that using hot water for cleaning kills the dirt and grime. 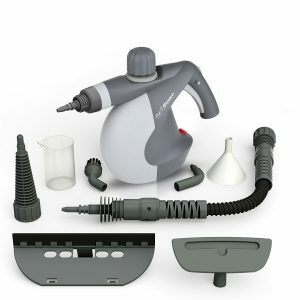 For using a steam cleaner for auto detailing, we recommend you to look for all the accessories and attachments with the steam cleaner. These attachments will allow you to clean under the seats, vents, cup holders, and other hard-to-reach places. But this information is not sufficient for all of you. There are various steam cleaners available in the market and choosing one out of them is a difficult task. Every model has its features and specifications which confuses more the buyers. In this article, we've assembled some top and best selling steam cleaners designed for auto detailing. And, we're pretty sure that after reading this article you'll be in a comfortable position to purchase a perfect one for your automobile. So the without any delay, let's get started. 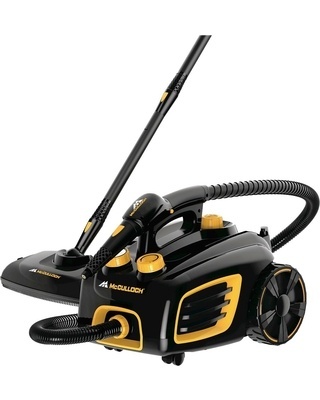 There first steam cleaner we've in our list is the McCulloch MC1375. The model gets quickly heated up and takes about 8-10 minutes if you begin with cold water. It has a 48-ounce water tank which will provide you a steam time of about 90 minutes (sufficient enough to clean the interiors of an average-sized car). Beside this, you can use this cleaner for removing grime and dirt from wheels and engine. Also, you can use it for cleaning floors at your home. Overall, a great product with lots of features and attachments. It doesn't require any specific chemical. The water gets sufficiently hot to sanitize. The steam-control switch of the device allowed you to regulate the amount of steam add per need. The lightweight of the appliance (11 pounds) allows you to put it on your back. Plus, it is easy to store even in an upright position. The inbuilt tank is not visible, so you can't tell how much water is required for auto detailing. No doubt, attachments are made of heavy-duty plastics, but if used daily, have to be replaced every couple of years. The second steam cleaner in our list is Vapamore MR-100 Primo. The device is bigger than the MC1375, the tank and power cord is also higher gives you more operating time. No doubt, the cost for this is also higher. The product comes in yellow color with a greyish hose. Looking at specs, the product weighs 9.3kgs and comes in a dimension of 33 x 35.6 x 38.1 cm. At bottom, there are large enough wheels present for easy gliding and maneuverability. Overall, it's a great choice for hectic jobs like deep-cleaning grout lines and pest control. It delivers a super cool operation time of entire one hour per tank with 50 PSI. The company has launched a new model with upgraded tools and accessories. It comes with a lifetime warranty over the unit and its parts. It do not indicate the amount of water remaining for the steam as the tank is not visible. It claims to reach the maximum of 220 degrees Fahrenheit, but we doesn't find it to reach full temperature capacity. Dupray is one of the top leading steam cleaner brands that manufactures high-quality products for domestic as well as commercial use. This Dupray ONE is a perfect choice for effective and chemical-free cleaning. 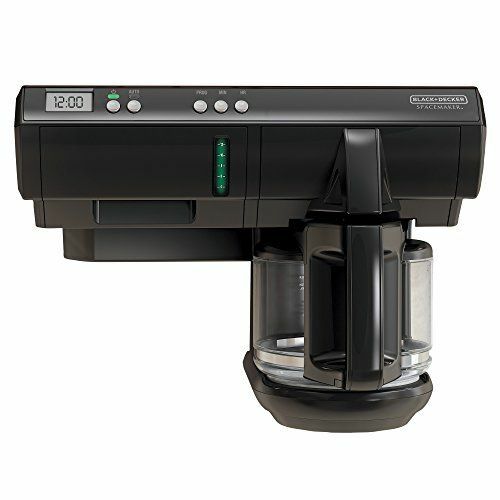 Technically, the product delivers powerful 303 degrees Fahrenheit steam with 50.8 PSI of steam pressure. One thing you'll like the most about this device is, it quickly gets heats up in about 8 minutes. So you don't have to wait longer. Another thing is the reach, and you'll get 1.8 meters to reach along with a 5-meter power cord. While the capacity of the water tank is also great, that will provide a clean time of 50 minutes. The device is built with advanced technology that can disinfect any surfaces with ease. The build quality of the device is very nice. The looks are good, and high-quality materials are used. The device comes with a total of 16 heavy-duty accessories for various kinds of cleaning activities. It delivers super hot steam and comes with useful safety features. No doubt, the price tag will be an issue for many. Not considered the best for carpets. Well, high-quality and expensive products are not always best to be used. 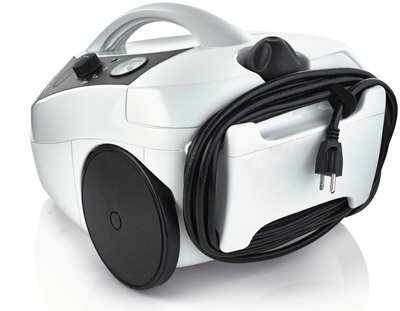 Many of you might be looking for an affordable steam cleaner, and it's called 'PurSteam Handheld Steam Cleaner.’ The company claims that they've designed this steam cleaner which produces 30%of more steam as compared with other steam cleaners that cost twice its price. The biggest point of this device is its nine attachments, which includes a funnel, towel sleeve, nozzles, and measuring cup. Removed dirt and grime very efficiently from over variety of surfaces. The small size of the device is the best thing. You can even use it at homes for de-wrinkling clothing and insect infestations. Spot-cleaning can be a matter of issue as the brush attachment swivels during the usage. Not recommended freely for heavy and big tasks. For all those tight-budget buyers, who are planning to purchase a steam cleaner for their automobile, pay attention! 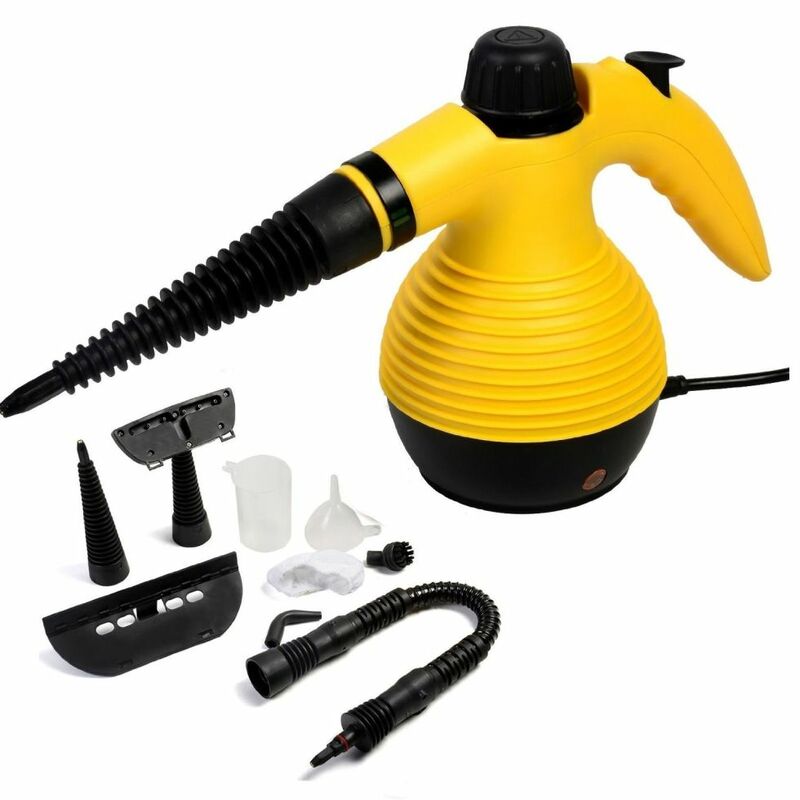 We're here with a perfect option for you called Comforday Handheld Pressurized steam cleaner. Plus, the small size of the device makes easy for users to carry it around the car. The machine is equipped with a 1050 watts power motor which can provide a maximum of 270 degrees Fahrenheit of steam. The size of the water tank is not the biggest we would say, but it will provide you operation time of 20 minutes. Looking at specs, the product weighs just about 4 pounds and comes in a dimension of 11.5 x 9.8 x 6.1 inches. 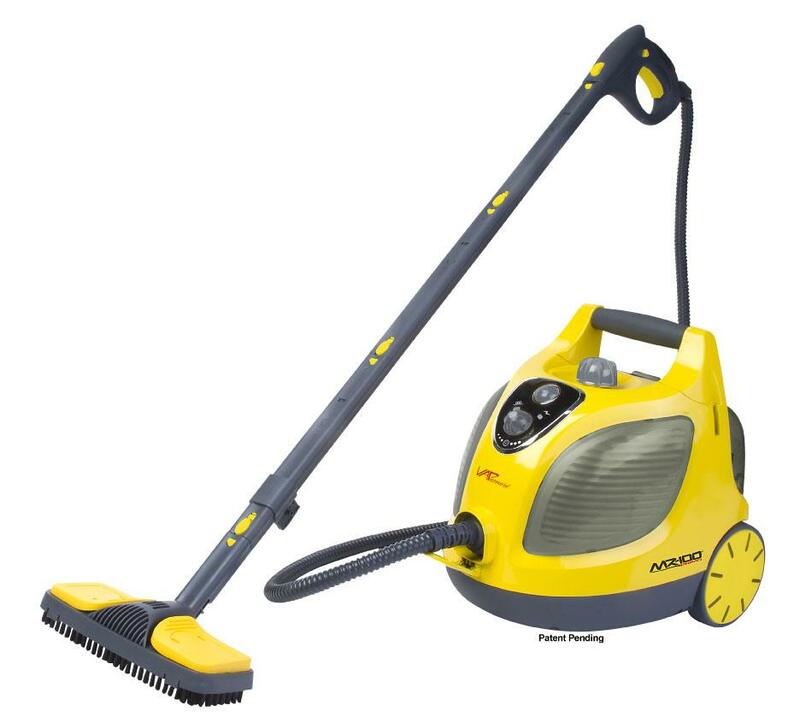 Moreover, it comes with 9.8-foot long power cord and nine multiple attachments for various type of cleaning. The size of the appliance is highly compact which don't require much space in your home. It includes a large enough power cord for easy reach. The price is the most impressive and highly affordable. The size of the device is too small for large upholstery and bigger tasks. The steam time can be improved.